If your pet rat has a round, movable bump on her face, head or body, she may have developed a cyst. Many cysts are benign, they pose little danger to your rat's health. But they may be unsightly, uncomfortable for your pet or even, in rare cases, indicative of a growing cancer. So speak to your veterinarian when a cyst appears. Cysts can grow anywhere on your rat. They are generally round and filled with either fluid, solid tissue or both. They may be pea-size or a few centimeters in diameter, so they are usually easy to see. Sometimes a cyst may grow on your rat's inner organs, such as an ovary or uterus, and you may notice an enlargement in the area of your rat's abdomen. Not all cysts are harmful, but any cyst can indicate an underlying health problem in your pet. Some cysts are simply caused by genetic disposition or injury. 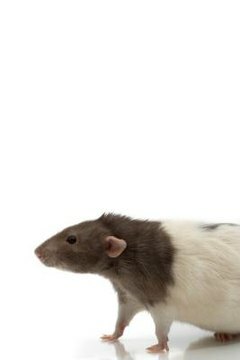 Others can indicate that your rat is suffering from a viral or bacterial infection. In rare cases, what appears to be a cyst may actually be an abscess or a tumor. Even benign cysts may cause pain or put pressure on your rat's internal organs, which could lead to health problems. Have a veterinarian take a look at any unusual growth on your pet. There are many types and causes of cysts in rats, and their treatment and prognosis will vary. When a gland becomes blocked, your rat may develop a tumorlike retention cyst -- the most common form of cysts found in rodents. Cutaneous cysts are found on your rat's skin -- often on his face, back or neck. If caused by an injury, this type of cyst will usually expand over a larger area in time and may fill with or become surrounded by yellowish pus. Extravasation cysts are found within a tissue wall and develop from the surrounding blood. An exudate cyst may occur when a mass of cells and/or fluid seeps into a closed cavity inside your rat's body. A hytadid cyst, also known as a "parasitic cyst," develops around parasite larvae that have been deposited inside your rat's body by a parasite. Your veterinarian may wish to remove all or a portion of a cyst on your rat in order to examine it more thoroughly. A removed cyst may return unless the accompanying sac has also been thoroughly excised. If your vet suspects your rat has an internal cyst, he may perform an ultrasound before commencing with treatment. Treatment could include ablation, cyst removal or, rarely, the removal of affected organs. If the vet thinks your rat's cysts may be caused by an infection, he may wish to culture a small sampling of the fluids from within the cysts before prescribing an antibiotic. For cysts caused by parasites, your vet will treat the parasitic infestation as well as the accompanying cyst. When surgical procedures are necessary, your vet will likely prescribe pain medication and oral or applied antibiotics for your rat's recovery.